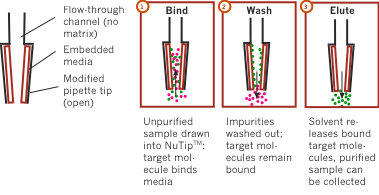 NuTip enables purification of low-concentration/volume samples by maximizing surface area in contact with the sample. The chromatographic media is embedded directly in the inner surface of the tip: there are no polymers, glues or matrices. This proprietary design prevents contamination or flow problems common in competitor tips. NuTips are available for different Liquid Handling Automation systems (Zymark, Multiprobe, Tecan, Hamilton, Gilson, Qiagen, and many more) without any further adaptor needed. Sold in packs of 96.